Moving on to the hardware of the HandEra, we see some of its more interesting and exciting features. Just like the TRGpro, the HandEra features an integrated CompactFlash+ slot for use with memory cards and CF peripherals. As of this review, the folks at HandEra have produced a driver for pretty much any CF-Ethernet and WiFi card out there - Yes, that's right. The HandEra supports 802.11b cards now. You can use your HandEra in a WiFi zone to check your e-mail and chat using the Palm AIM client, or browse the web using a 3rd party web browser. HandEra provides all of the background framework for most PPP-enabled applications to use whatever connection you set up using a CF modem, Ethernet card, or WiFi. Ethernet speeds were reasonably good, but don't get any ideas about syncing over Ethernet. I tried this many times and while I was able to sync some small applications and databases, I had a significant amount of trouble with anything over 100K. Usually it'd time out before completing the sync, and even sending a small 20K file would take over a minute. Generally the HandEra would only exchange four packets of data every ten seconds. On the other hand, running a telnet session using Top Gun telnet was perfectly useable, and downloading mail messages from my POP3 server didn't take any time at all, which lends me to believe that a problem with the HotSync configuration tools in the OS itself. As a further note, configuring HotSync to work over Ethernet is not at all well documented, and requires a rather long procedure of changes and preference selections�so I would chalk this up to a hack that exploits a capability in HotSync that wasn't originally intended to be used this way. On the other hand, the CF+ slot works great for pretty much anything else. CardPro lets you install applications from your CF card - Great if you have a laptop, since you wouldn't need to have the HotSync cradle with you�but there is a caveat - CardPro doesn't handle application databases very well. The rule of thumb is that if your application is just a single PRC file, you can do it, but otherwise, it's probably not going to work the way you expect it. Yet another differentiating feature between the TRGpro and the HandEra 330 is the inclusion of a SecureDigital memory slot. While the SD slot doesn't feature any significant peripherals yet, it does still provide a useful secondary memory interface if you're also using a modem or other non-memcard peripheral. My favorite use for this feature was as a backup system. Hypothetical situation - You've found a new shareware app that you can't wait to try. You install the app, and suddenly, as it's working, your Palm throws up a memory pointer fault, and locks up. You try soft-rebooting, but to no avail. You could reboot and clear the system memory, but you just keyed in this great girl's phone number in your PDA yesterday, and you forgot to sync last night! With a just a 16 MB SD memory card, you can easily back up your PDA's entire memory and keep the backup in the HandEra until you need it. 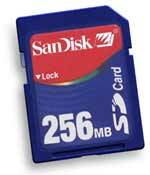 As an added protection, you can also write-protect SD memory cards, adding to the safety of your data. You can use the CF slot for this as well if you want - As a matter of fact, the CompactFlash interface is almost twice as fast as the SD interface. Copying a 7.4 MB file took 18 seconds using a 16 MH Kingston Tech. CF card, and 37 seconds on a SanDisk 16 MB SD card. Since the CF interface is far more useful, you'll probably overlook the speed difference and use the SD slot for its convenience. As you can see above, SD memory cards are available in reasonably massive capacities. One other new use for this memory interface, as many Palm m-series owners will attest, is the distribution of secured applications. The original intent of this interface, the SD slot allows for Palm and other software companies to sell applications for your Palm that can't be copied to other devices - They just run straight from the card. This is useful since it will promote 3rd party developers to create more commercial software, but for most people, the annoyance of carrying around ten different SD cards, each with a single app, will far outweigh the benefits of the added Palm-based software available, most of which is likely replicating a function already available in shareware/freeware apps.